SMARTS Decision Manager provides an extremely fast, standards-based deployment platform for predictive analytics that accelerates model deployment and provides a platform to define, test and deploy the operational decisions driven by those models. In SMARTS, decisions combine predictive models with business rules that take actions based on model insights to drive tangible value. SMARTS uses the Predictive Model Markup Language (PMML) standard to import and deploy predictive models. PMML is an XML standard for the interchange of predictive models developed by the Data Mining Group. PMML models can be moved among different tools and applications without the need for custom coding. A PMML model can be developed in commercial or open-source data mining tools (such as SAS, SPSS, KNIME, R or Python) and directly deployed in a SMARTS decision service. Traditional methods to deploying predictive models typically involve the data science team developing a predictive model and passing it to IT for manual coding and implementation in operational systems. This process can be time-consuming and error prone resulting in significant delays and causing organizations to miss market opportunities. Using SMARTS, data scientists can export a PMML model from their data-mining tool of choice and business analysts can import the model into the SMARTS environment where they write rules to apply the model insights to business decisions. The model-driven decisions can be tested and deployed as a decision service in a scalable operational environment. The web services API of SMARTS decision service enables real-time scoring on one transaction or document at a time or on multiple documents for batch or on-demand mode. SMARTS significantly accelerates the deployment of predictive models and reduces IT costs associated with model deployment. Using SMARTS, organizations are able to immediately leverage critical data insights to drive more accurate decisions and seize market opportunities. SMARTS decision analytics features allow you to measure and prove the quality of the predictive models developed by your data scientists in the context of the actual automated decisions. When a model is ready for deployment, data scientists have validated the statistical accuracy of the model. Once a predictive model is imported into SMARTS you can go a step further to evaluate the model in the context of the actual decision it is driving. Using SMARTS you can run large-scale simulations comparing one decision strategy to another to determine the best approach. Decisions strategies can differ based on the model(s) used in the decision or based on the actions taken for a given model or set of models. This allows you to make the most impactful and effective use of predictive models in your operational decisions. 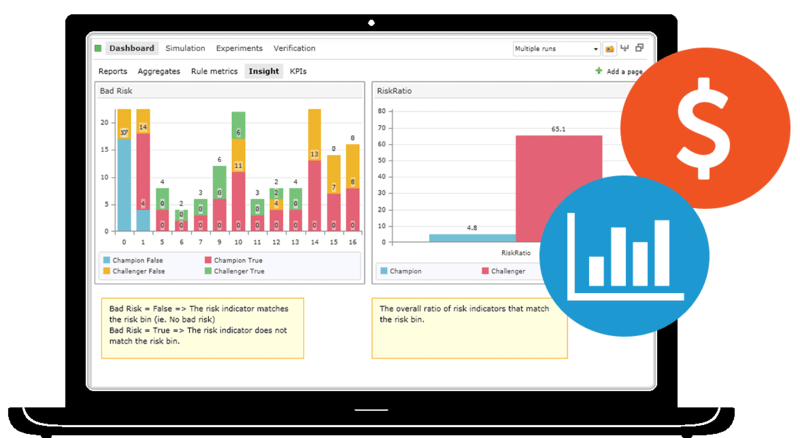 SMARTS also offers built-in support to set up and deploy Champion / Challenger experiments so you can continually measure and improve the quality of your automated decisions. SMARTS is available in a cloud environment as a fully hosted SaaS solution so that as your business grows you have a cost effective expansion path. For customers that need to manage their data within their own physical environment or need to execute behind the corporate firewall, SMARTS is available on-premise as a fully configured virtual appliance that is installed in your virtualization-hosting environment.